When Lucy, Elena, and Michael receive their summer reading list, they are excited to see�To Kill A Mockingbird�included.�But not everyone in their class shares the same enthusiasm. So they hatch a plot to get the entire town talking about the well-known Harper Lee classic. They plan controversial ways to get people to read the book, including re-shelving�copies of the book�in bookstores so that people think they are missing and starting a website committed to �destroying the mockingbird.� Their efforts are successful when all of the hullabaloo starts to direct more people to the book. But soon, their exploits start to spin out of control and they unwittingly start a mini revolution in the name of books. Lucy, Elena and Michael are three best friends who are about to enter high school. Their English teacher, however, will stay the same. As they go to Catholic school, they have summer reading. This summer, they’ve been assigned to read�To Kill A Mockingbird by Harper Lee. Lucy is excited because she has great taste in books and it is her favorite book of all time. However, not everyone is as excited as Lucy which makes her sad. You see, her previous English teacher,Mr. Robert “Fat Bob” Nowak died of a heart attack, and it was always his tradition to assign�To Kill A Mockingbird as summer reading to eighth graders who are about to be high schoolers because they would be ready for it. Anyways, Lucy along with her best friends Elena and Michael, hatches a plan to get people talking about�To Kill A Mockingbird and to make Lee’s classic go viral and become part of the conversation again. It’s a plan that involves reshelving the book and making people think there’s a limited supply, thus driving up demand. Will it work? Friends, you’ll have to read this book to find out. “‘You might be thinking that you’re already a good reader,’ Mr. Nowak said. More than a couple of us shifted in our seats. Guys, I just loved the characters of this book. They are sort of quirky, but in a way they you are like, okay this person is not annoying and they could be real. I could relate to Lucy’s love of Harper Lee’s classic. I could relate to Lucy’s crush on her friend and this whole worry about ruining the friendship. This book is pretty chaste though. I could relate to Mort, the used bookstore owner, and his love of books, all kinds of books and people who drive a hard bargain. I loved Elena and her creativity. I loved that this book is about characters who are so passionate about reading that they put on a secret, viral campaign for one book. 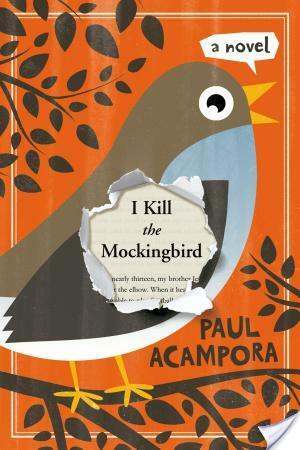 I just want to hand�I Kill The Mockingbird by Paul Acampora out to people. Yes, it’s middle grade. Yes, one of the books you were probably forced to read in school plays a central role in this book. Yes, this book skews young. But, at it’s heart, it is all about making books a part of the conversation in our daily lives. Now, I know if you’re reading this books are a part of your conversation already, but I guess hmmm, my point that I am trying to make is that somehow this book made me feel part of a larger picture. I just really felt something for these kids and their efforts for making books viral. Passion speaks to me, I guess. I loved this book too and added it to my list of favorite MG/YA books of 2014 so far. If you liked this I suspect you will also really enjoy most of the other ones I included. They all spoke to that same wonderful book and knowledge loving nerd in me. Ok you’ve persuaded me, April! I will be reading this! Someone actually recommended it to me, and I had considered reading it before, but now I’m entirely convinced that I would love this book and should read it asap. I loved To Kill A Mockingbird and I love books that are about books, so this one sounds like a definite winner. And hey, if you want to hand this book out to people, I’ll be right there waiting in line! 😉 great review! Yay, Courtney! I am so happy to hear this. If I did not leave my office at the office I would totally offer to send this. Alas, it’s out of my hands now. Okay, I am SOOOO reading this book. I just put it on hold and i cannot wait to get my hands on it. Hopefully soon. I love that passage. I think all us book nerds and book bloggers can relate to that. Oh, Quinn, this book is fantastic. It’s such a fun middle grade read with a really great message that is not at all hokey or syrup-y, ya know? This one sounds so meta! I think it is wonderful that I see an influx of TKaM references everywhere. I am going to have to check this out and add it to my buy list! It actually really is kind of meta. I Kill The Mockingbird is great, it’s totally one of those books that I want to shove on everyone, partially because of my undying love for TKaM. I Kill the Mockingbird sounds FANTASTIC! You’ve seriously convinced me that I want to read it with your review, especially because I sense that I will enjoy it as much as you did. Plus, that excerpt you included here? MAJOR BONUS. Adding this to my TBR today!